Tower Repairs - Work Completed! 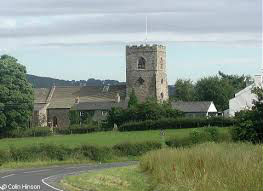 All Hallows Church, overlooking the River Ribble at Mitton, has been a place of worship from 1270 to the present day. We are a welcoming congregation, many of whom have long standing family connections to the area and this Church. At the end of April 2017, Revd. Canon Brian McConkey became the vicar for the newly formed united benefice of All Hallows, Mitton, St John's Hurst Green and St Wilfrid's, Ribchester. Brian is kept very busy with three parishes to look after. In July 2018, Revd, Karen Herschell joined him on the clergy team as curate to the three parishes. Brian, his wife Sue and their daughters are pictured below. Our Sunday services take place at 9.30am and follow a largely traditional format. Tea and coffee is served after the service providing the opportunity for people to chat and for us to welcome visitors and those enquiring about their faith. Children of all ages are welcome at our services and we have activity packs available and on the 3rd Sunday of each month a member of our congregation will lead specific activities aimed at children of primary school age or younger. There are also areas away from the main body of the church if the children need to run around and be themselves. 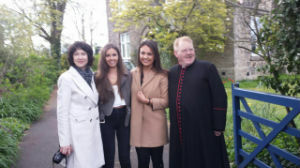 Weddings are a very important part of our offering to the Parish and wider community. The Church and its location is very attractive to wedding couples and we are happy to accommodate those who have a connection to the Parish or who are committed to regular worship at the Church, if they wish to be married at All Hallows. More information about Weddings is provided on the "Weddings" page on this website. We share a number of events and activities with our sister church of St John the Evangelist at Hurst Green and are increasingly getting involved with activities and services that take place in Ribchester. Since 2014 we have been part of the Diocese of Blackburn, having previously been in the Diocese of Bradford – a result of historic boundaries. We are enjoying being part of the Blackburn Diocese and the Whalley Deanery and the easy access we now have to Diocesan resources and activities.